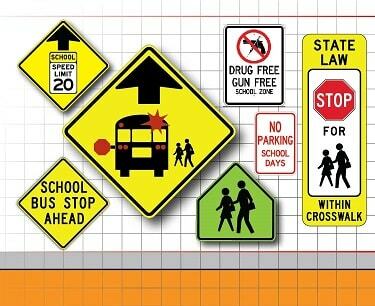 Our School Zone Signs are MUTCD / DOT compliant and made with the highest quality .080 aluminum, coated with the industries best 3M or Avery reflective sheeting and printed to last beyond the sheeting warranty. Best quality every time. 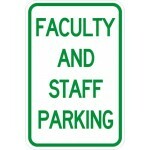 School Area Signs will help you direct school traffic, parking and keep kids safe. Many signs now available in Fluorescent Yellow Green Sheeting. All school signs will meet MUTCD and State DOT compliance. Ideally, the school zone starts at the front door and encompasses the campus and as many blocks as possible that surround the school and have a high concentration of school-generated traffic. Often the school zone includes the streets along the school and usually the area one to two blocks around it. The school zone should be marked with special signs to alert drivers of the high concentration of children. School crossing signs, speed signs, school zone pavement markings and other traffic calming devices remind drivers to treat the area with special care and attention. Q: Am I required to use Fluorescent Yellow Green (FYG) background color signs for warning signs for pedestrians and bicycle application, or is FYG to be used only for school zone area warning signs? A: Fluorescent Yellow Green background color is now required for warning signs and plaques for school zone area traffic control and is optional for pedestrian and bicycle sign applications.